Many of you may be familiar with the website wordle.net. It is a sight that generates “word clouds” from text that you provide. There is greater prominence given to words that appear more frequently in the source text. 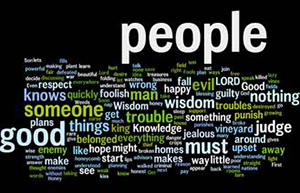 Out of curiosity, I entered Proverbs 24 into wordle and you can see the results of the word cloud generated. What speaks to you, what do you see? …the larger words? …the positive words? … the white words? Look closely. Put on those reading glasses to see those little bitty words because they are important too. When studying scripture I am prone to notice the text that I am familiar with, perhaps the ‘large’ ‘positive’ ‘white’ words. Lately I have been challenged to seek the Spirit’s guidance to identify the part of the passage that God desires me to see. That happened recently while reading Proverbs 24. There it was for me – in black and white: ME, ME, ME — I faint, my strength is small, I falter, I fall to pieces…then I heard the whisper “April, MY strength.” It is about relying on HIM. HE does not faint, HE does not falter in a time of trouble, HE does not fall to pieces in a crisis. It is HIS strength I need, HIS strength I claim, HIS strength HE offers all day everyday. I’m so thankful to see/hear/have God’s wisdom, instruction and strength. I would like to encourage you to ask for the Spirit to speak to you. Go ahead, reread Proverbs 24. What does God desire for you to see/hear/have today? This entry was posted in Proverbs and tagged 1hbs, A Proverb A Day, April Stephenson, Proverb24. Bookmark the permalink.